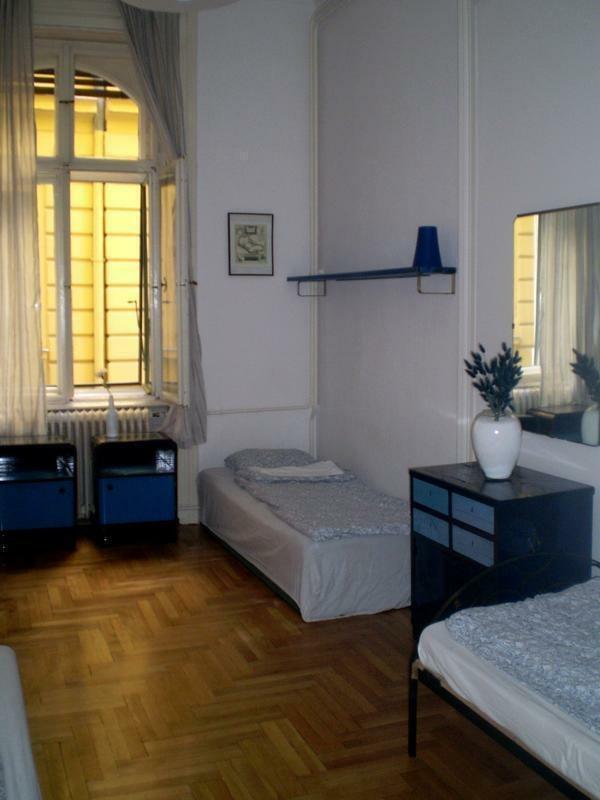 Located in a quiet street, nestled between the riverfront and the famous cafe street Vaci utca, the Green Bridge Hostel offers dorm beds, private rooms and apartments at a reasonable price in the busy downtown. We are just one block from the Danube River in the heart of the old walled city of Pest. As well as the facilities listed below, we have Free Cable Internet (and wifi), Free Espresso, Free DVD Library, 24 hour hot water, clean toilets and showers, flexible check-out, and an easy-going atmosphere. Our English speaking staff can answer all your questions about the city, tours (caving, biking, statue park) and your travel onwards and around. Trams and metros nearby can take you anywhere in the city. From the train stations KELETI or DELI take the Red Metro line to the central station DEAK TER and change to the Blue Metro and go two stops to KALVIN TER. As you exit the metro turn right at the top of the escalator and head down the underground passage way at the end of which you will head up some stairs. Continue straight down the road (called Vamhaz Korut) 180 meters to towards the Green Bridge at the Danube River. Just as you approach the Danube you will see a small green area with an asphalt path going through the middle of it to your right. Just walk the 20 meters down the path and you will come to the beginning of Molnar utca (parallel to the riverfront). Walk down Molnar utca two blocks and find the corner house, push the GREEN BRIDGE button. From NYUGATI train station, and NEPLIGET (international bus terminal) go downstairs to the Blue Metro and go two stops to KALVIN TER. As you exit the metro turn right at the top of the escalator and head down the underground passage way at the end of which you will head up some stairs. Continue straight down the road (called Vamhaz Korut) 180 meters to the the Danube River. As you reach the Danube you will see a small green area with an asphalt path going through the middle of it to your right. Just walk the 20 meters down the path and you will come to the beginning of Molnar utca (parallel to the riverfront). Walk down Molnar utca two blocks and find the corner house, push the GREEN BRIDGE button. From the AIRPORT catch the 200 BUS to the last stop which will take you directly to the end of the Blue Metro line called KOBANYA-KISPEST. From here take the Blue Metro to KALVIN TER. As you exit the metro turn right at the top of the escalator and head down the underground passage way at the end of which you will head up some stairs and continue straight down the road (called Vamhaz Korut) 180 meters to the the Danube River. As you reach the Danube you will see a small green area with an asphalt path going through the middle of it to your right. Just walk the 20 meters down the path and you will come to the beginning of Molnar utca (parallel to the riverfront). Walk down Molnar utca two blocks and find the corner house, push the GREEN BRIDGE button. Also if you decide to take a TAXI just take Zona Taxi. They will take you anywhere in the city. From the airport to us (downtown) is 5200 (21 euro) forint per taxi. This way you can avoid being overcharged. If you are alone the Airport Shuttle Minibus costs 2990 forint per person from the airport to the downtown.